New York-style, high tech, artsy looking apt. 2 bedroom/2 full baths. Pool, Jacuzzi and tennis courts. Public Golf Course directly across the street, within a short walk. Highly desirable location in the South End of Palm Springs. Close to Highway 111, the Parker Hotel, Tahquitz Golf Course, and lots of trendy clubs and restaurants. It's just like having a private home in a resort, but it's in the middle of a vibrant city, where you can escape to the quiet atmosphere and yet, can be in the heart of the village within 10 minutes. This rental is good for families with kids. There is enough sleeping space for 5, as it is furnished with 2 queen beds and living room futon sofa. Since there are 2 bathrooms and one has 2 sinks, there is never a wait. Two balconies face East and South, and bright sunlight is reflected off the white carpeting and dazzling sleek glass and chrome furniture. Posters by Andy Warhol, Lichtenstein, and movies of the 60's and 80's add to the style of a fun, upbeat and playful vacation and remind you that you are in the midst of the so-called "Rat Pack" of the 1960s. Must be rented for a minimum of 30 days according to HOA rules. The Espirt Complex is located in a great area. We stayed at this condo for our two month stay in Palm Springs (Feb/March 2017). The condo located on the second floor was roomy and comfortable. Loved the layout with each bedroom located on either side with attached bathrooms. Both beds were comfortable. Was happy to have laundry in the condo. The condo was quiet, no issue of noise from other units. Lots of parking spots available. Enjoyed sitting on the deck looking out over the city. Sun in the morning and shade for the hot afternoons. The pool area was excellent, with lots of room to suntan, swim. We used the hot tub just about every night. After staying in many areas in Palm Springs, this location was one of the best. 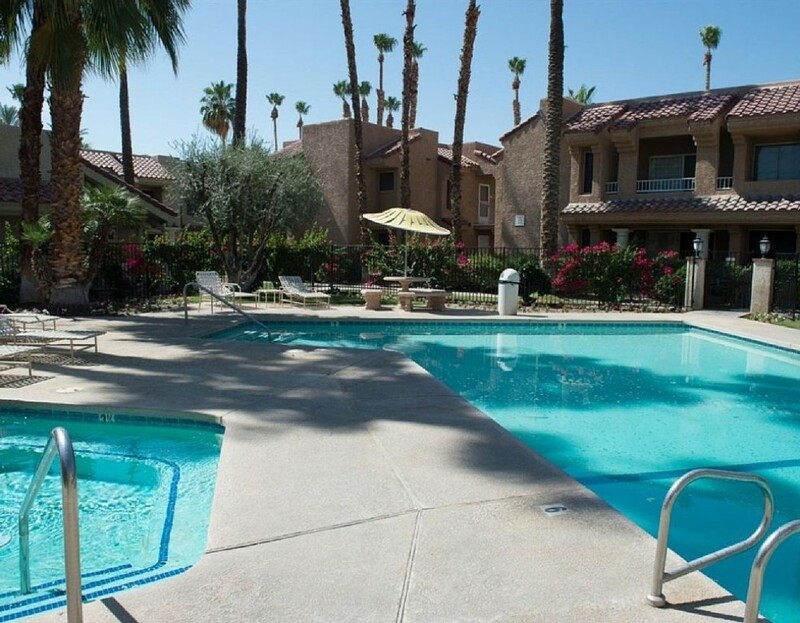 Located close to hiking trails, shopping, airport, Highway 111 and the I10 freeway. Golf courses down the street. Nick the owner was a pleasure to deal with, easy to get ahold of if you had any issues. Would definitely stay here again.